Many of you have probably read about the “LightLane” concept dreamed up by the fertile minds at Altitude, Inc. of Somerville, Massachusetts. The concept has been covered on a wide variety of cycling and design blogs, but there wasn’t a whole lot of information included. Thank you for showing interest in our LightLane concept. We are extremely excited about the response it has been receiving, which has spurred us to continue down the development path. The origin of the idea was purely conceptual, as Alex and I had entered a design competition to promote commuting by bicycle (editor’s note: the design competition was Bicycle Design’s excellent “Commuter Bike for the Masses” contest). Having witnessed several friends be hit by cars while in traffic, we felt the intimidation of sharing the road was one of the bigger barriers to commuting by bicycle. However, we also noticed that our personal comfort on roads with bicycle lanes was much improved so we set out to understand what the differences were between these two situations. Clearly one of the biggest benefits of bicycle lanes is that there is an established common boundary that both drivers and riders respect and must stay within. However, this requires a great deal of resources and planning to implement, so we decided to focus on the fact that the bicycle lane establishes a safety buffer outside of the bicycle’s footprint. After experimenting with physical ways of increasing the perceived size of the bicycle, we quickly realized all of these would compromise the rider’s safety by increasing the probability of accidental clipping. It was at this point that we decided to project a visual boundary onto the adjacent pavement using a laser. Although it doesn’t establish a clear and predictable path for a rider to follow, it does encourage a driver to provide the rider with a wider berth by capturing their attention in a different way. Currently we are building a beta prototype where we will be experimenting with different laser colors and orientations. Once the optimal laser configuration has been established and validated, we will quickly develop a fully functional unit where we will focus our efforts on several aspects of usability including theft prevention, cleanability and corrosion resistance. Concurrently we will be looking for manufacturing and distribution partners. It’s been truly remarkable to see the excitement that this concept has generated, especially considering it was just a fun quirky idea to begin with. What’s been equally interesting in my opinion is to see how the product has pushed the debate of who owns the roads. This well established debate has been a common point of discussion within my own family, and clearly the LightLane, nor any product, will solve it. Instead we hope that it connects with people in a new and fun way. 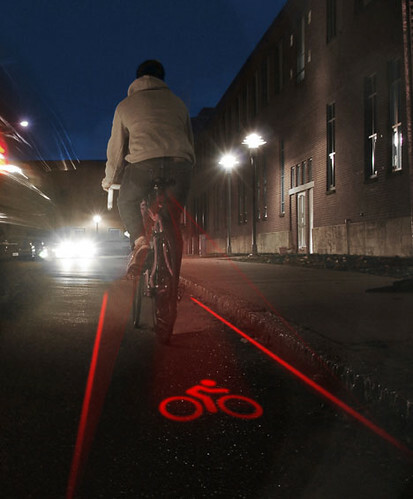 Thanks, Evan, for responding — there have been lots of great comments on the various sites that covered this concept, including different laser colors (green lasers for more daytime visibility) and even aiming the lasers into following motorists’ eyes (not such a good idea). Let’s hope this concept reaches a prototype soon, as the idea behind it is full of possibility! James over at the excellent Bicycle Design blog has posted the six finalists (out of over 60 entries) to his “commuter bikes for the masses” design contest. Check out the finalists by visiting this link. There are some VERY intriguing concepts over there…but like one of the commenters, I’d love to see the rest of the designs as well. Head on over and check it out…and when you do, is there anything that catches your eye? Do any of these solutions help encourage non-cyclists to swing a leg over and starting riding to work?